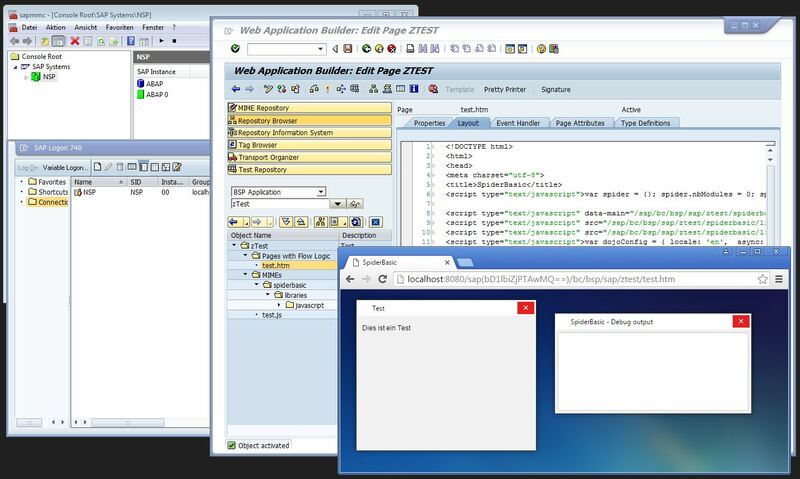 here a tiny preview at my actually SAP test environment, I load the SpiderBasic framework in the SAP MIME repository, add the html file as BSP (Business Server Page) and correct the pathes to the script files and voila - SpiderBasic works on the SAP Web Application Server. 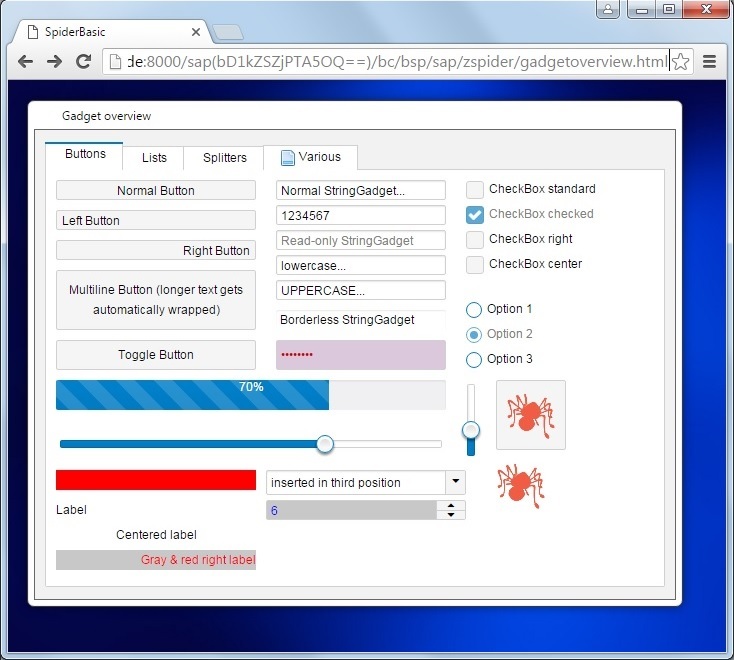 In combination with my post here you can use now SpiderBasic seamlessly with SAP. 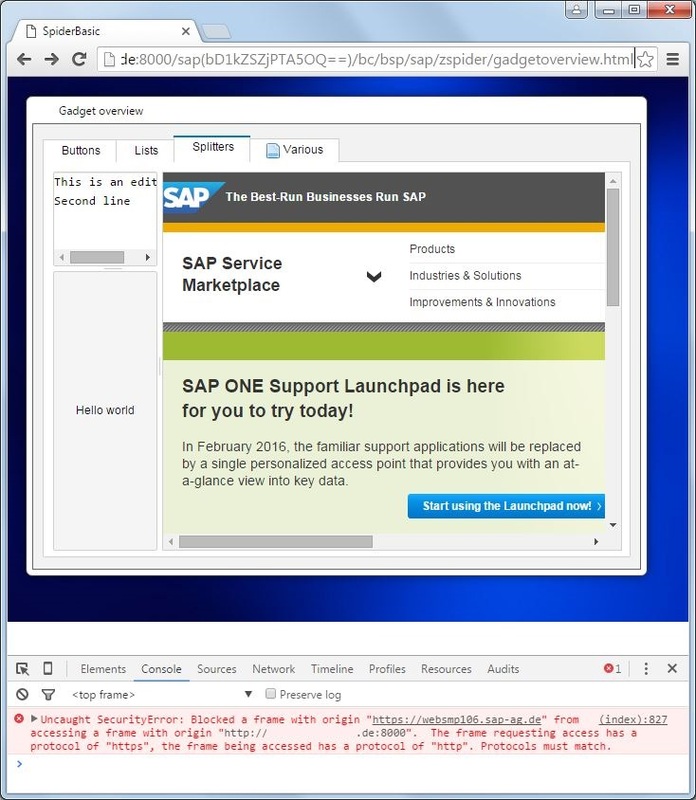 The next steps is to connect an SAP system via WebService or OData service, with this possibility you don't need an extra data layer like SQLite database. You can connect to the SAP system directly and you can use CRUD(Q) operations. For that a good preparation is my suggestion from here. And later to expand the HTTPRequest, to manipulate the header. Here now more results from my experiments in a business environment. 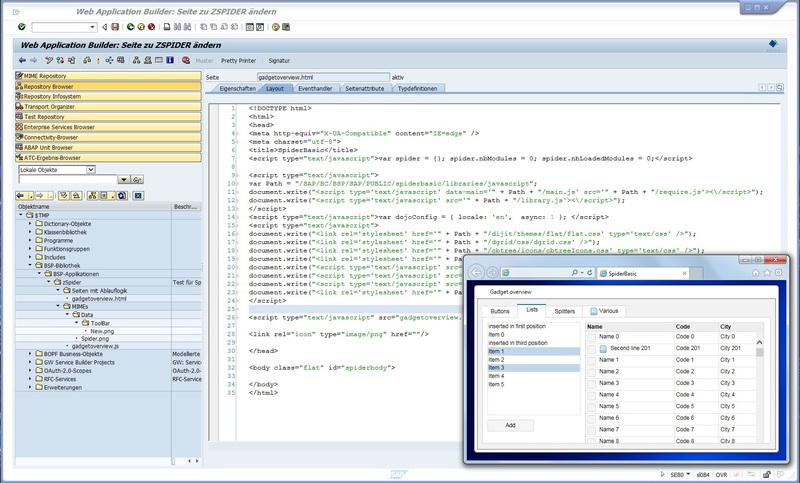 At first I transfer the SpiderBasic framework in a public folder of the SAP MIME-Repository. In this case you don't have any security restrictions and each other BSP can access to the framework without problems. I check your example GadgetOverview and it works as expected. 1. In the SpiderBasic framework are files with 0 byte size, like document.css in dijit\themes\flat directory. The SAP MIME-Repository don't accept files with 0 byte size. To avoid errors it is necessary to insert e.g. a space in this files. 2. The WebGadget works perfect in the environment, but it generates a security error. 3. The business works primarily with the Internet Explorer, so I add the meta tag <meta http-equiv="X-UA-Compatible" content="IE=edge" /> in my html code. I think it is a benefit if this meta tag is always in the html code. For my experiments I modify the html code. I add the possibility to work with a flexible path of the SpiderBasic framework. On this way it is easier to experiment e.g. with different versions.